Preheat oven to 450 degrees F (230 degrees C). Lightly grease a baking sheet and place in the oven. Place sweet potatoes in a large bowl. Add olive oil, salt, and pepper; toss to coat. Spread sweet potatoes onto the baking sheet. Bake in the preheated oven for 20 minutes. Turn the fries and continue baking until brown and crispy, about 15 minutes more. The oven temperature was too high, one side burned at 20 minutes, and the potatoes were cooked at that point. Delicious! I followed the advice of another reviewer and baked them at 400 degrees and checked them after 10 minutes and flipped them over for 10 more. Added rosemary for a little extra spice. Very delicious! Crispy on the outside, soft on the inside! I baked them at 200 degrees C for 20 minutes stirring halfway through and they turned out great! Thanks for a wonderful recipe! I lowered the temp and had them in for less time. They were deeelish! These were very tasty! 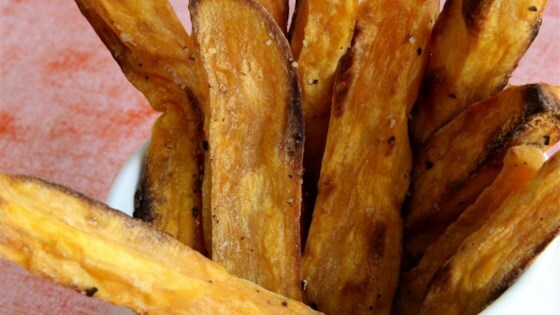 As a couple of other reviewers stated, even my husband who isn't a sweet potato fan loved them! I made these but only with Pam Olive Oil spray and pink Himalayan salt because I’m in a strict diet. I didn’t need to cook them so long so they were a tad “well done” but still good!